Great Fictional Bands: MING TEA - UPDATE 4/11/14 | Warped Factor - Words in the Key of Geek. Yeah Baby! Geek Dave starts a new series looking at some of the great fictional bands that have appeared on film and television. First up it's the turn of the faux 60s pop/rock combo Ming Tea. Like most people I first became aware of Ming Tea during Austin Powers: International Man Of Mystery. Throughout the film there are little Monkees-style cut scenes featuring a snippet of the band playing, then, of course, there's the rather brilliant song BBC that plays over the closing credits. But Ming Tea were more than just a fictional band put together for the film, rather the Austin Powers movies came about as a result of a the very real band Ming Tea. After leaving Saturday Night Live, Mike Myers put a reduced version of the band together featuring himself, ex-Bangle Susanna Hoffs and singer/songwriter Matthew Sweet. 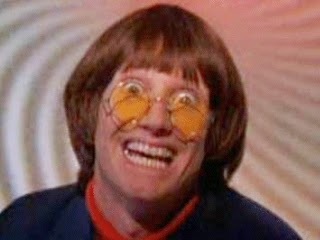 They all performed under pseudonyms, Sweet as Sid Belvedere, Hoffs as Jillian Shagwell and Myers as Austin Powers. The name Ming Tea was chosen after viewing the 1965 Ursula Andress movie, The 10th Victim, which features the fictional Ming Tea Company. After hearing them perform, Myers wife at the time, Robin Ruzan, encouraged him to write a film based on his new stage character. He penned Austin Powers: International Man Of Mystery and approached Hoffs' husband Jay Roach to direct the film. Two extra members were added to the line-up for the movie, actor Stuart Johnson as Manny Stixman and songwriter Christopher Ward as Trevor Aigburth, and all members played their respective instruments. This is something I've always liked about Ming Tea, you have yourself a mix of real talented musicians in this fictional band. Looking at all the individual members, first up we have the lead singer, Mike Myers. He does surprisingly well, OK he's not winning any awards for his vocals but they are more than adequate, clearly he's another comedian who is also a frustrated wannabe pop-star. Christopher Ward has had huge success as a songwriter, he penned the hit Black Velvet for Alannah Myles. Matthew Sweet had much solo success and has recorded with REM front-man Michael Stipe amongst many others. Then there's Susanna Hoffs, that girl from The Bangles. I'm a huge fan of Hoffs and her solo work, although sporadic, it has always been excellent. She's also one of the most attractive women on the planet as far as I'm concerned, and at 55 she's clearly made some deal with the devil as she looks half that age. That was the last we saw of Ming Tea, but Matthew Sweet and Susanna Hoffs continued to work together. They have so far released three cover albums, Under The Covers Vol 1,2 & 3. Each one features some of their favourite songs and tracks that influenced them. Vol 1 included songs from the 60s and was released under the name Sid and Suzie, a kind of nod to their Ming Tea days. Although it's been 12 years since Goldmember was released there are occasional rumours of a fourth Austin Powers movie happening, if it ever does comes around then I really hope Ming Tea would be back in their 60s groove. Yeah, baby! FICTIONAL ??!! We were REaL BaBY !!! We rehearsed at Austins place, wrote our own songs ( perhaps 10 or so) played the Viper Room and El Rey theatre , recorded our own respective instruments at Rumbo and Capitol records for the Austin Powers soundtracks.. It was real as real gets. bands slog it out for 20 years and never achieve half the stuff we did. I do wish that more people got to see the live show. Its was fun, just ask Rob Lowe and Christian Slater and Beverly D'angelo and John Paul DeGregorio and his wife ..They were all there... And THEY were Real. And the band was SHAG-A-RIFIC !!! Thanks for setting us straight Mr. Stixman. Er, Mr. Johnson. That is very "groovy baby!"